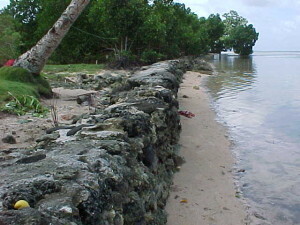 Sometime in the 1970s an artificial channel was created through the coastal berm between Leap and the old Elementary school at Pilyuul in Walung (opposit Srukames Island). The purpose was to create a shorter drainage path (the natural outlet was at Infal Panyea further west) to improve drainage of the low-lying swamp land behind the coastal berm. Create a strong current that flows through the channel in an inland direction when the tide is rising and in a seaward direction when the tide is falling. These currents have enlarged the opening causing loss of land on both sides of the opening. Both waves and currents have acted to move sand from the adjacent beaches and wash it into the opening and swamp areas behind the opening, causing erosion and loss of land along the coastline, particularly at Leap. There have been a number of attempts to close the channel by using coastal defences such as gabions all of which have been unsuccessful. Creating new drainage channels rarely improves drainage as it allows sea-water to flow in at high tide. The flow of sea-water in and out of the created drainage channel will change the shape of the channel and the adjacent coast typically leading to loss of land. It will lead to the low-lying areas in, and adjacent to, the swamp becoming increasingly salty. Once such channels have been created it is very difficult to fill in the channel and return it to the situation that existed prior to the channel being constructed.